These are my Christmas version of my favourite easy snack, Bliss Balls! Scrumptious, Christmassy and healthy sweet treats that are so easy to make – just whack everything into a food processor and then shape into bite-sized balls. I’ve been taking them along to end-of-year gatherings and they disappear very quickly! Most kids enjoy making these and they’re easy for gatherings because they’re gluten-free, refined sugar-free, dairy-free, low-GI and raw (which means no baking!). Kids love also love eating them and they won’t go “hyper” or off-the-planet-&-into-orbit on them (which is always helpful at Christmas). 1. As a base, either use one and a half cups of cashew butter, or if you have a food processor that can make nut butter, use 2 cups of nuts and wait until the processor has turned them into a smooth creamy paste. I like using half cashews and half almonds. 3. Stir in a handful of dried cranberries (I just “pulse” the food processor a few times) and then shape the mixture into balls. Roll them in shredded or desiccated coconut to coat. (* If you can’t get fresh dates, soak some dried dates in some water for an hour or so – but try to find some that haven’t been coated in vegetable oil). I’d love to be able to tell you how many this makes but I can’t because every time I make them I lose count of the number that I eat along the way because they’re too yummy! To make these even more healthy and full of useable energy, you could “activate” the nuts by soaking them overnight and then giving them a really good rinse before using them. Make sure the cranberries are good quality without any added sugar or vegetable oil. These can be hard to find but our own Health Food store in Huonville stocks them, as well as all the other necessary ingredients. Overseas bliss ball fans might be able to find these ingredients in health food stores too. 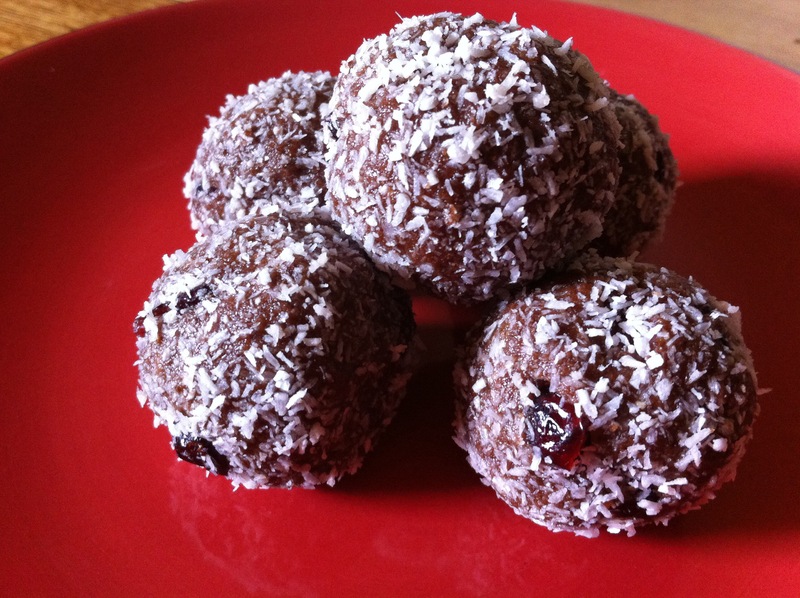 Of course, these would be delicious using local blueberries and alternative nuts – you just wouldn’t get to call them “Cashew Coconut Cacao Cranberry Christmas Balls”! Maca Powder is reputed to be beneficial for your hormonal system and adrenal & is high in vitamins, minerals, enzymes, all the essential amino acids and it contains nearly 60 phytochemicals. Maca contains unique alkaloids that stimulate the master glands, which in turn improves the overall functioning of the endocrine system. I find it a good muscle-nurturing & building food too. Cacao powder is loaded with antioxidants, magnesium and nutrients that can help keep you energised, and in a good mood. Those of you who know me, know I’m a chocoholic! Good quality organic fair trade cacao his is how I satisfy my craving for chocolate and stay healthy at the same time! Cranberries are high in vitamins C and E manganese and a large array of phytonutrients, naturally occurring plant chemicals that help to protect the body from harmful free radicals and offer anti-inflammatory and cancer-preventing properties. Coconut paste or coconut oil, when organic and cold-pressed, is a very healthy fat that can actually speed up your metabolism. As Loving Earth’s website explains: “Medium Chain triglycerides (MCT’s) are abundantly found in Coconut Oil. Unlike other forms of fat, the liver is able to metabolise MCT’s similarly to how it utilises carbohydrates as a fuel source. Coconut Oil’s digestibility means that it is quickly absorbed by our bodies, and not left to circulate the blood stream like other fats. The MCT’s in coconut oil have also been shown to have thyroid supporting mechanisms. Studies that were conducted on the basal (resting) metabolic rate of people who ate MCT’s comparative to those participants who consumed more LCT’s (long chain triglycerides i.e. vegetable oils) were found on average to have a 12% increase in their basal metabolic rates”. Cashews are rich in “heart-friendly” monounsaturated-fatty acids like oleic and palmitoleic acids. These essential fatty acids help lower harmful LDL-cholesterol while increasing good HDL cholesterol. They’re a great source of essential minerals, especially manganese, potassium, copper, iron, magnesium, zinc, and selenium. Don’t worry about the calories! (Calories are irrelevant, just eat good food!) and you’ll naturally feel too satisfied after eating a few of these because they’re so nutrient rich, that you won’t feel you have to eat too many anyway. Almonds are high in good quality protein and are a source of vitamin E, copper, and magnesium. They lower LDL cholesterol and can help protect against diabetes and cardiovascular disease. If you make them, let me know in the comments below if you enjoyed them, and any variations you tried!